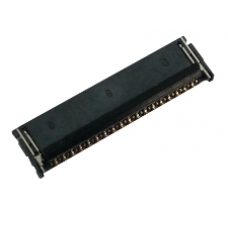 The touch screen / digitiser FPC ribbon connector is a surface mounted component located on the iPad 3 logic board and allows connection of the touch screen / digitiser cable. This part can be easily damaged if care is not taken when removing the screen assembly from the iPad 3 logic board. These parts are brand new. Do not accept imitations from China as these parts may be faulty. When performing touch screen repairs or general repairs that require disconnecting the touch screen from the logic board, it is easy to damage the clips or the actual gold plated pins. Note: replacing this component requires surface mount soldering skills.